Find out how a cartoon from the early 20th century influenced some of the greatest comic strips of all time and the complicated racial identity of the who man drew it. During the 1910s, New Orleans cartoonist George Herriman created one of the greatest and most influential comic strips ever: “Krazy Kat.” Now, Michael Tisserand — who’s penned several non-fiction books about New Orleans people and culture — has published an exhaustive biography called “Krazy: George Herriman, a Life in Black and White.” It’s about Herriman’s life… and the secret that only came to light after his death. Rico Gagliano: First of all, “Krazy Kat,” not incredibly popular in its day. And I bet most people have never encountered it in the modern day. Summarize what the strip is like and what made it great. But Krazy Kat is a comic about a little white mouse named Ignatz, and a black cat named Krazy Kat, and a dog named Officer Pup. And it’s kind of a love triangle, but it’s a love triangle that goes in lots of different directions. Ignatz is obsessed with throwing a brick at Krazy Kat. Krazy Kat receives the brick as a true sign of Ignatz’s love. And Officer Pup harbors a secret deep and unspoken love for Krazy Kat himself. Ignatz has a wife and 3 kids by the way, but that doesn’t seem to matter much. And neither does it matter to all these characters that Krazy is both male and female… or neither… or both. Krazy Kat was invented in 1910 as a gender-fluid cat. Rico Gagliano: Had anything like that ever appeared before? Michael Tisserand: No, and it drove readers crazy. You know Capra, the filmmaker who did “It’s A Wonderful Life”? Rico Gagliano: Frank Capra, sure. George Herriman was a really smart and real well-read guy, by the way. He was always bringing Shakespeare, Dickens and Cervantes and all these things into the comic. Michael Tisserand: Yeah. And Patrick McDonnell is a student of George Herriman, and visually and spiritually, I would even say, is a follower of George Herriman. There’s a light, delicate, joyfulness in “Mutts” that comes out of Krazy Kat and Ignatz. Rico Gagliano: In a way, though, all of this talk about Herriman’s work is kind of secondary to the fascinating tale of Herriman’s life. Your book is subtitled, “Life in Black and White,” and that is because for basically his entire life. Herriman passed as a white man, when in fact, he was a person of color. First of all, tell us the story about how that fact came to light. Michael Tisserand: “Must be a different George Herriman.” But indeed it was, it turned out to be our George Herriman. And that was doubted for a long time in comics scholarship and by others. And people were kind of right to doubt it — because there is a lot of funny business that goes on in New Orleans City Hall when it comes to birth certificates and racial designations. There have been famous stories of people going, “That family says they’re white, but they’re not white!” And scratching out things on the birth certificate and things like that. Rico Gagliano: Actually, one thing in the early chapters of your book that you do vividly get across is just how bewilderingly complex race relations were in the turn-of-the-century New Orleans that he was born to. There were all these different levels of status for non-whites, with different laws and traditions governing each one of them. Rico Gagliano: It’s not easily answered as “black” or “white,” basically. Michael Tisserand: It’s not. They were creoles of color, and it’s a rich, complex tale. Rico Gagliano: I will say though that one of the first questions you raise in the book is when Herriman himself became aware of his background because his parents also passed as white. What is the answer to that? Michael Tisserand: We should say, the phrase “passing as white”… it’s exactly what they did, but it’s also this historic phrase that we’re so glad to have back there during that time. But what did he know, when did he know it, and what did the family talk about? I can’t say for sure. I can’t even tell you what his wife knew. And Herriman never talked about it. He was known for always wearing a hat to cover the tight curls in his hair. And he was working in newspapers where black men couldn’t work. He was living in places where black men couldn’t live. He was married to a white woman, which is something that blacks were being lynched for at the time. And then, in 1902, when he was 22 years old, he did this comic that lasted for just 4 or 5 episodes called “Musical Mose.” And it was about a black man who set out to do an impersonation of a Scotsman, or an Irishman, or an Italian, and go play music. So he’d pick up a fiddle and go play an Irish song, and everyone would say, “Listen to that beautiful music!” And then in the next panel they’d get a look at him, and they’d pummel him down. Rico Gagliano: He was addressing these issues and trying to speak to it in the only way he could — through his art. Let met close this out just by talking to you as a fan. 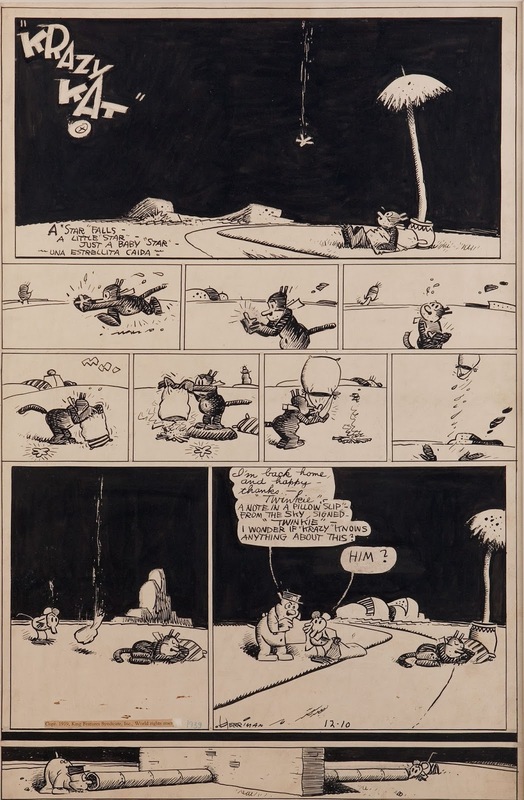 What is your favorite moment in “Krazy Kat”? Michael Tisserand: The one that really hit me the hardest — it kind of stopped me in my tracks when I encountered it — was one he had done just after his daughter died. His daughter died young. She had seizures throughout her life. She died in the late 1930s. It’s such a personal statement of grief and love to show up in the comics.